Looking at the kite in the corner of the office we started thinking about using it to grab some geotagged images from our N95. 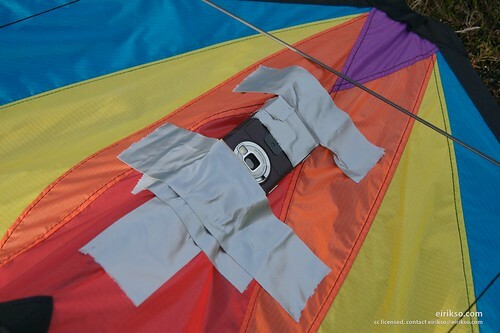 A quick google search later however shows that we have been well and truly beaten to it – there are a number of examples out there ranging from attaching a N95 to a remote control plane to the more traditional kite aerial photography. The N95 has built in GPS – if you then link the GPS with its 5 mega pixel camera in timelapse mode it holds the possibility of good quality aerial imagery. See Scotts site for more info on his kite flying and Pictearth for advanced image acquisition using lightweight, easy to use UAV, GPS, high resolution sensor, live communication and Pict’Earth software. Don’t see where the GPS comes in. If you polylined it it’d look like a spider inked strugling round a piece of A4. The functionality to map images would buffer to the timeline and GPX out-put enough to shock your server side into not bothering to do it again. perhaps altitude rather than lat lon would be of interest? Sounds like you want an excuse to the enjoy the fine weather we”re having. Actually, PictEarthUsa.com has been using the N95 for some time now in their UAV and has over 4000 photos of places in southern California.